Thallus: foliose, medium-sized to large, (1-)3-6(-10) cm across, membrane-like, closely adnate, conspicuously, deeply and broadly lobate lobes: (0.2-)0.5(-1) cm broad, thin, (50-)60-105 µm thick, apically rotund or extended, +overlapping upper surface: dark olive-green to brownish black, paler and +transparent when moist, strongly but broadly ridged (wrinkled); ridges: radiate, sometimes pustulate in young parts of thallus, becoming long, narrow and flexuous, 0.1-0.3 mm wide, up to 1.5 mm tall, simple or branched isidia: very numerous, mainly on ridges and older pustules, sometimes on margins of old lobes, mostly terete (rarely somewhat flattened) but globular when young, 0.05-0.15 mm broad, up to 0.2(-0.3) mm long, primarily simple but becoming branched when old, concolorous with thallus or slightly darker lower surface: dark olive-green to brownish black but paler than upper surface, smooth, sometimes forming a typical pseudocortex on both sides, or with inner hyphae +loose but very thick with rather short cells Apothecia: rare to very rare, 0.5-1.5 mm wide, 0.3-0.5 mm thick disc: epruinose or pruinose, plane thalline margin: densely isidiate proper exciple: euthyplectenchymatous to +subparaplectenchymatous or euparaplectenchymatous in var. luzonense, with cells to at least 10.5 µm thick hymenium: hyaline, 85-110 µm tall asci: clavate, 8-spored ascospores: hyaline, bacilliform, narrow fusiform or acicular, often curved, 5-6-celled, 40-80 x 3-6.5(-8.5) µm Pycnidia: common, globose or subglobose, superficial centrally but immersed marginally, on both sides of thallus, concolorous with or paler than the thallus, colorless to pale or dark yellow within with dark apex conidia: bacilliform, usually somewhat swollen towards ends, 4-6 x c. 1 µm Spot tests: all negative Secondary metabolites: none detected. Substrate and ecology: on bark in conifer and riparian forests, especially on broad-leaved trees (Populus or Quercus), occasionally on rocks, generally in moist but well-lit habitats, very common at higher altitudes World distribution: widely distributed in the Northern Hemisphere, from the arctic to Mediterranean areas in Europe, Asia and North America and extending to northern and eastern Africa, South America, and Oceania Sonoran distribution: Arizona, southern California, Baja California, and Baja California Sur. 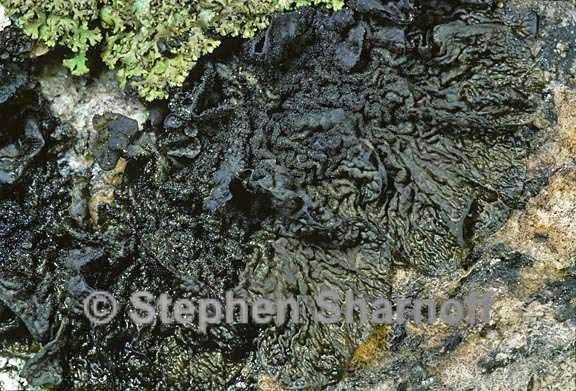 Notes: Collema furfuraceum is characterized by its distinctly pustulate and longitudinally ridged thallus with cylindrical to coralloid isidia mainly restricted to the ridges and pustules. Isidiate specimens of Collema nigrescens are similar, but its isidia are globose or coarsely clavate. Col-lema subflaccidum is also similar, but usually lacks distinct ridges and pustules and its isidia are mainly globose and spread more evenly over the thallus. Occasionally, Col-lema furfuraceum has apothecia with usually a densely isidiate margin. Collema furfuraceum var. luzonense differs in its densely pruinose apothecial discs and in having an euparaplectenchymatous proper exciple, whereas the thallus, isidia and ascospores are identical. Pruinose apothecia are also found in Collema subnigrescens f. caesium.